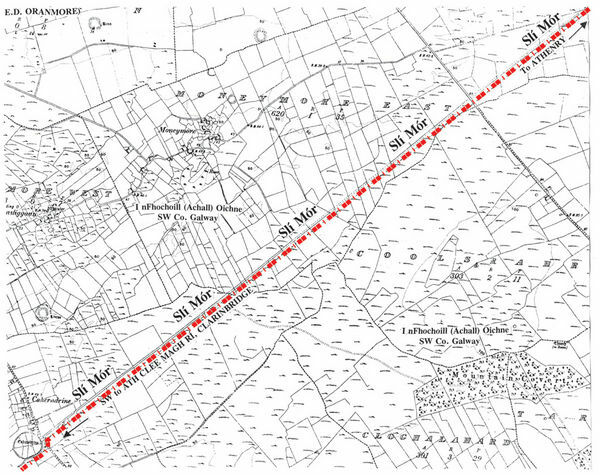 Caheradrine's strategic massive 'toll-gate' entre-pot on the Sli Mor (there proudly proclaimed "Ireland's oldest highway") from Athenry SW to its Clarinbridge Black Rock terminal's outlet through Ballynamanagh River to Dunbulcaun Bay. From Caheradrine (al. Fidaci Regia, Fideg fort, where King Art was assassinated & Eoghan Mor of Munster based his Duhallow defenders, the Oga Bethra; Lec 164; Rc. xvii, 7; Ca 302; Laud 610) it diverged to Ath Clee Magh Ri wharves in Mweeloon Bay, Caher na Managh on Clarinbridge River, & Roy Mor, Dun Cethelen & Stradbally West Weir on Dunkellin (Dur)/Kilcolgan River.